Hi, I'm trying to run a script which involves getting current clipboard data & storing it in a variable. It seems whenever I try to run this script with the workstation locked, I get this error - https://i.imgur.com/PRQTvfW.png . This doesn't happen 100% of the time, it's very sporadic. 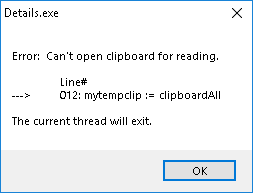 Can anyone else confirm whether they get the same error when trying to read the clipboard with workstation locked?